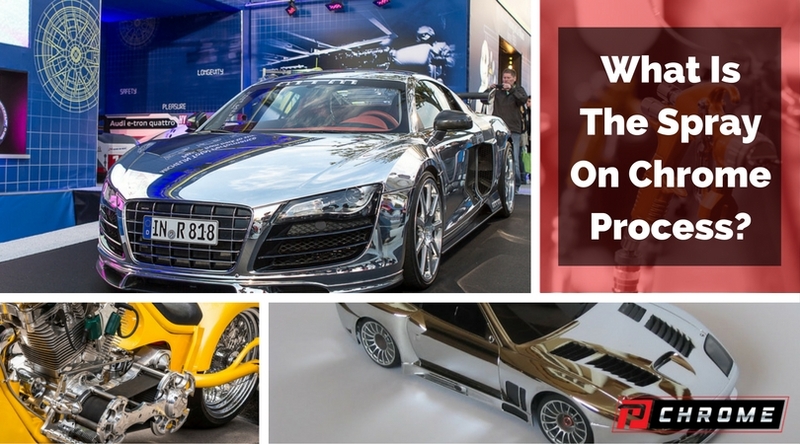 People love the gleam provided by chrome on their automobiles, ATVs, artworks, statues and decorations. Traditional chrome plating is limited in what it can be used for by the item’s size and shape. It is also very expensive and bad for the environment. Spray chrome is an excellent alternative. It gives the same high-quality gleam and provides a thicker finish that is very durable and strong. It is much easier to apply, requiring a series of sprays. Spray chrome is also better for the environment than chrome plating is because it does not rely on the toxic acid washes that are required for traditional chrome plating. Completing the spray on chrome process will give you the results you want at a fraction of the price. When you receive your kit, it will include several solutions that are marked with the letters S, R, W and D. To mix the S, R, and D solutions, mix each one in a separate spray bottle in a ratio of one part of the solution to 30 parts deionized water. For the W solution, the proportion will be four parts of the solution to 30 parts deionized water. Mix just enough of each solution for what you will use in a day. To mix the base coat, mix together equal parts of the 2KA base with the 2KB hardener. To this mixture, add 20 percent of the black reducer. Prepare the surface you will be chroming by smoothing out any rough spots with sandpaper and then using primer all over it. Then, using back-and-forth movements, apply the base coat with your spray gun. It is best to work from the bottom of the object to the top. Let the base coat dry and cure for about 24 hours. Make sure you clean your spray gun with acetone or paint thinner. After the base coat has cured, sensitize the surface using your W solution that you mixed up before. Next, using your single-nozzle spray gun, apply the D solution all over the object and rinse it with deionized water. Then, repeat your applications of the W solution followed by the D solution and rinse again. Without allowing the surface to dry, apply your spray chrome using your double-nozzle S and R spray gun, again working your way from the bottom to the top. Continue applications until you have reached the desired result. Finally, use an air blower to blow off any water droplets from the surface. The top coat mixture is made by mixing equal parts of the 2KA and 2KB together with 20 percent of your clear reducer. You will want to prevent yellowing by adding 1 milliliter of violet for every 125 milliliters of solution. Only apply this top coat when your part is completely dry. Full hardening will take about 48 hours. Once that has happened, you can apply a second top coat if you wish. Make sure that you thoroughly clean your spray guns and put them away for your next chroming project. When you follow these steps, you’ll find that the spray on chrome process is much simpler than you might have thought. You can order your kit today by visiting our online store.